Click the button below to add the CPR202 - LARGE IMPRESSIVE ANCIENT SILVERED FOLLIS ROMAN COIN IN 14KT GOLD BEADED PENDANT SETTING to your wish list. This finest collector-grade ancient Roman coin was minted under the rule of Constantius I, otherwise known as Constantius Chlorus. He was the father of one of the most famous and influential rulers of the Ancient World, Constantine the Great. As the father of Constantine, a number of Christian legends have grown up around Constantius. Eusebius's Life of Constantine claims that Constantius was himself, a Christian, although he pretended to be a pagan. 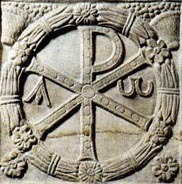 While Caesar under Diocletian, he took no part in the Emperor's persecutions of the Christians. His first wife, Helena, claimed to find the True Cross. This incredible coin is a large, silvered bronze follis coin and it displays the crispest and most ideal strike, detail and preservation! The coin is mounted in a handmade 14KT yellow gold beaded pendant setting. The display side shows a remarkable profile of Constantius with the reverse side showing Genius, standing and holding a patera and corniucopiae. The ancient Roman idea of Genius was considered a spirit that helped all living things, similar to a guardian angel or spirit protector. Certainly, one of the most impressive display pieces one could hope for using a genuine, ancient Roman coin. The silvering has given way to the warm, patinated bronze beneath, lacking any corrosion or degradation of the metal. This combination of colors really adds to the overall character of the coin!